The quirky, lengthy, quite informative but at times downright badly translated booklet essay discusses at some length a ‘what if’ scenario. What if, Josef Suk had not come so much under the influence of his father-in-law Dvorák in his earlier days. What if the double tragedy of Dvorák’s death and that of Suk’s wife had not hit him within a year and what if Suk was now considered as fine a composer as Dvorák, after all, and especially on the evidence of the Opp. 1, 2 and 3 recorded here he had a precocious and natural talent. It seems incredible that the Op. 1 Piano Quartet was written by a boy of about fifteen even if it was, I gather, a little revised under Dvorák’s guidance before its 1891 premiere. Three powerful movements beautifully voiced and each given an emotional charge and imbued with melody and beauty and several striking effects. It’s the longest work on the CD and its worth remembering that a Piano Quartet is a demanding form for any composer; I speak from a certain experience, because all instruments need to be involved and active throughout. For a young composer this is a great achievement but for you as a listener the fact that Suk was a teenager is irrelevant to the music. It is there to be carried away by. It’s worth adding that even before this work Suk had written a Mass and a Fantasy for strings. The Op. 2 Piano Trio which begins the disc is a step forward from the Quartet, not emotionally but formally with a very powerful opening movement. The booklet notes by Eckhardt van den Hoogan speak of Dvorák who having heard the work by this sixteen or seventeen year old at a student concert in Prague was very keen on it and told the young man that he “should continue his seeking”. The second movement is something approaching a Habanera; it certainly has the right rhythm. The finale, which is succinct and lively, seems to have a hint of the Eroica scherzo with a touch of the Bohemian. It was just a few years later that Suk became Dvorák’s son-in-law and is, this music attests, in many ways his rightful heir. The Op. 3 is a two movement work for cello and piano. The Ballade and Serenade were written six years apart. The notes give us no clear dates but 1891/7 seems about right. The Ballade is moving and intense and the Serenade is tripping, light and airy, an ideal counterweight. It is beautifully and warmly played and balanced in this recording. Jumping now to Op. 17 we come to the Four Pieces for Violin and Piano. Suk earned a good living as a violinist in the newly founded Bohemian, later the Czech String Quartet. His Grandson (born 1929) was also an (even finer?) violinist of international repute. I wondered at first why these pieces weren’t in fact called a Sonata. I expected therefore to find four little pieces which could be performed separately. Whilst that is, I suppose, still the case, the work is structured in a loose sonata fashion. First a Moderato (Quasi Ballata) followed by a scherzo movement oddly enough marked ‘Appassionata’. The slow movement which is in ternary form is marked ‘Un poco triste’ and the finale, a perpetuum mobile, is lively and brief marked ‘Burleska’ These according to the booklet notes “are not a set of occasional pieces” and I agree. They are often emotionally charged and harmonically quite complex. For a less punctilious composer it would surely have been called a sonata. Perhaps Suk wanted to avoid the Brahms influence that was all-pervasive at the time and certainly held a strong sway over him. Chronologically the latest work is the Elegy for Piano Trio. This is basically a ternary form structure and was written for a curious combination of strings and harmonium for a memorial service to his great friend the poet who had inspired several of Suk’s works Julius Zeyer. Zeyer had died suddenly in 1901. He and Suk were working on a project- a cantata based on a folk tale entitled ‘Pad Joabloni’ Op. 20 (Under the Apple Tree) when he died. 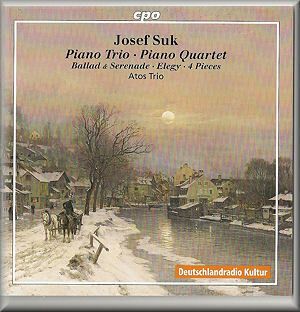 Suk wrote a heart-felt but not depressingly elegiac lament which he also transcribed and published as a Piano Trio. The performances are excellent and I really appreciate the close but airy recording. This is music which deserves and receives fine renditions from each of the artists and the sort of superb presentation which it gets here.